Learn about the features and benefits of the first-class Vintage Keeper wine refrigerators and wine cellars. Vintage Keeper has made a name for itself by manufacturing quality and durable wine accessories including refrigerated wine cabinets since it started to operate in 1983.Considering the capacity and the quality materials Vinrage Keeper wine coolers are very cost-effective wine storage units offering the cheapest cost per bottle prices on the market. Note: The Vintage Keeper Nuvo line is no longer made by the manufacturer. A new line of wine cabinets (WineKoolr) will be available sometime in 2011. 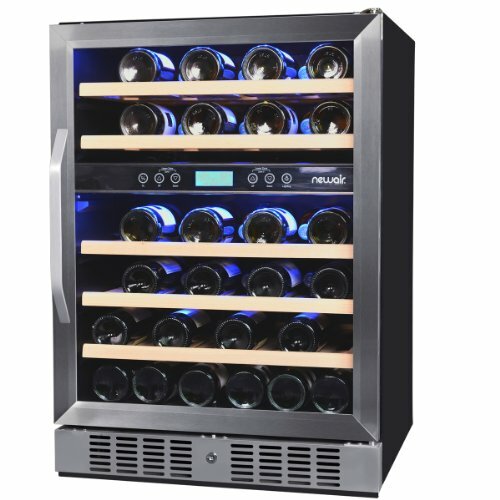 The older models are still available in larger wine cooler, wine storage shops. Four models in 3 finish colors are available in the 110 – 500 bottle capacity range. All models come with 1-year no-hassle warranties. You can opt for extended warranty on the cooling unit. Warranty is porvided for only in continental US and in Canada. Placement and Maintenance of Vintage Keeper Wine Coolers ? Make sure the floor where you place the cooler is level so the doors close correctly. Vintage Keeper wine coolers must be placed indoor where ambient temperature doesn’t exceed 80 ° F (27 °C) and humidity level is between 50 – 80 %. These cabinets weren’t designed and manufactured to withstand greater fluctuations in ambient temperature. So do not place your Vintage Keeper wine cooler in garage, basement room, attic, laundry room or in any non-climatized unventilated room. If the cooler is in a room where temperature often goes above 80 °F, that will cause the cooler unit to work overtime resulting in increased electricity bill. 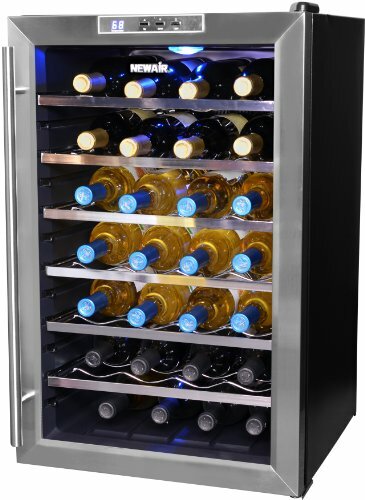 For wine storage appliances designed to operate within harsher conditions check out EuroCave wine coolers. Occasionally vacuum the evaporator coils to get rid offdust. The coolers plug into normal residential outlets: 115 V/15 Amp. The power outlet must be a dedicated, grounded, separately fused line. In this attractive wine cooler you can store 110 bottles of wine. The unit consists of modular sets that are very easy to assemble at home. Detailed and easy-to-understand instruction shows you step by step how to assemble the cabinet. The simple-to-install snap-in metal shelves are space economic. The shelves are stationary. The thermopane, UV filtering, see-through glass door is standard for which a lock & key set is included. The door is reversible. The interior lights mounted on the top inside the cabinet provide nice illumination and perfect view of your stored wines. The cooling unit is regulated by a microprocessor control ensuring accurate and constant temperature inside the cabinet. Another benefit of the cooling is the quiet operation that you can set to run on Hush, Normal, or Turbo mode. There’s a container at the back of the unit for gathering the condensate. With the large touch pad control you can adjust temperature between 50 – 72 °F. the evaporator coil has epoxy coating that ensure very good protection against corrosion thus ensuring the longevity of the wine cooler. Leave 4 ” space from wall for adequate ventilation. Price of the Vintage Keeper Nuvo Wine Cellar – Model VP 110: cc 750 -895 $ (6.82 – 8.14 $ per bottle). 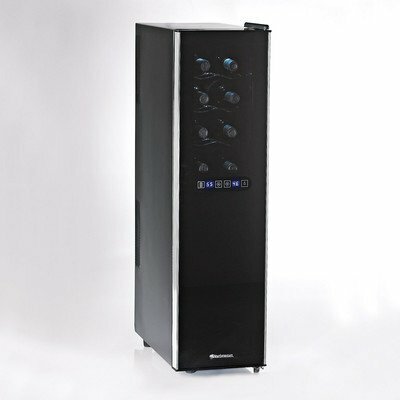 This 2-door wine cabinet can accommodate up to 500 bottles of wine in double depth placement. The wooden framed, tempered glass door is tinted to filter out UV rays. The door comes with two lock-key sets. 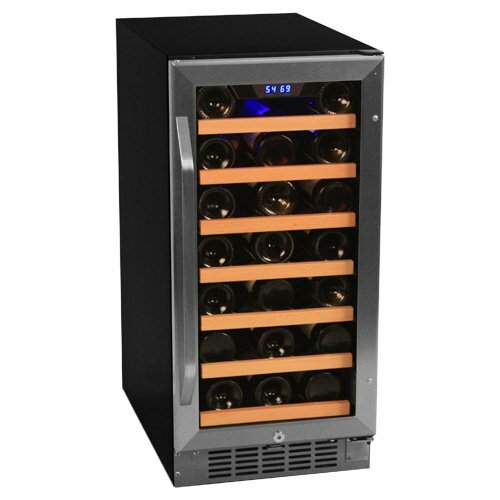 Other features are the same as the 100-bottle Vintage Keeper wine cooler described above. Price of the 500-Bottle Vintage Keeper Wine Cellar: cc. 1490 – 1800 $ (2.98 – 3.6 $ per bottle). 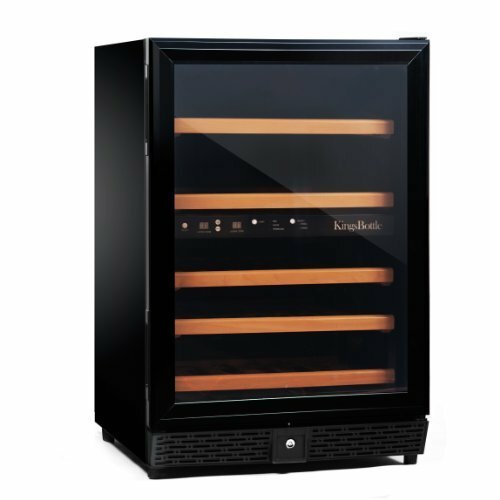 Read a full review of the Vintage Keeper Nuvo VP 500 Wine Cellar. Unfortunately many users of Vintage Keeper wine cabinets have reported problems and that they’re not satisfied with the product. The most serious problem experienced is that the cooling unit breaks down and needs replacement after 1-2 years. The result of the low price is that lower quality materials are used for the construction of the cabinet (the door starts to sag, lock starts to dislodge). Similar ProductsVinotheque Wood Wine Cellars are high-end storage cabinets with powerful cooling systems designed for both residential and commercial use.The Le Cache Contemporary Wine Cellars also offer large storage capacity. NFINITY 340-Bottle Wine Cabinet – affordable multi zone unit with double door design by Wine Enthusiast.